TestForSpeed is a toolbar that belongs to Mindspark family. Mindspark company has created a lot of potentially unwanted applications throughout the years and has annoyed many users with its products. TestForSpeed Toolbar is no different: it is not particularly useful to people and it actually makes it difficult to browse as safely as before. Some users might download the application from the official page because the creators offer a lot of benefits related to the installation of the toolbar. In reality, you have to remove TestForSpeed from your PC as soon as possible. Do not fall for the marketing tricks used by the creators. You see, the toolbar should help you check your Internet connection. Also, it is claimed that the PUP (potentially unwanted program) will help you “get internet speed tips, access email quickly, watch movies and more”. Many PUPs have a lot of promises on their pages. Their true nature is revealed only after the installation, as it is in this case. Why is TestForSpeed Toolbar dangerous? So, why should all users uninstall TestForSpeed Toolbar if there are so many promises given? Well, the moment this toolbar is installed, it modifies your home page, default search engine, and new tab. From now on, you will have ask.com instead of your preferred website. These changes can be done to all browsers, including Google Chrome, Internet Explorer, and Mozilla Firefox. You will be able to revert these changes only after you erase TestForSpeed Toolbar completely. Now you should read why it is dangerous to use the browser hijacker that has been brought to you by the toolbar. You see, it should be able to display some things that may interfere with your browsing. This means that you should start seeing a lot of links that are sponsored by third parties as well as commercial and non-commercial advertisements. This is rather dangerous for one reason: malware. By clicking on ads or sponsored links you might be redirected to a corrupted website. If you do not want viruses on your PC, delete TestForSpeed Toolbar as soon as possible. How did my personal computer get infected with TestForSpeed Toolbar? One of the infection sources is the official page of the toolbar testforspeed.com. Some users read the description and decide to download the toolbar by themselves. Unfortunately, the PUP is also spread in software bundles, in other words, many people get this application unwillingly and suddenly. File sharing websites are the pages that distribute bundles most often. No matter which way of distribution was used, you have to remove TestForSpeed Toolbar from your system. 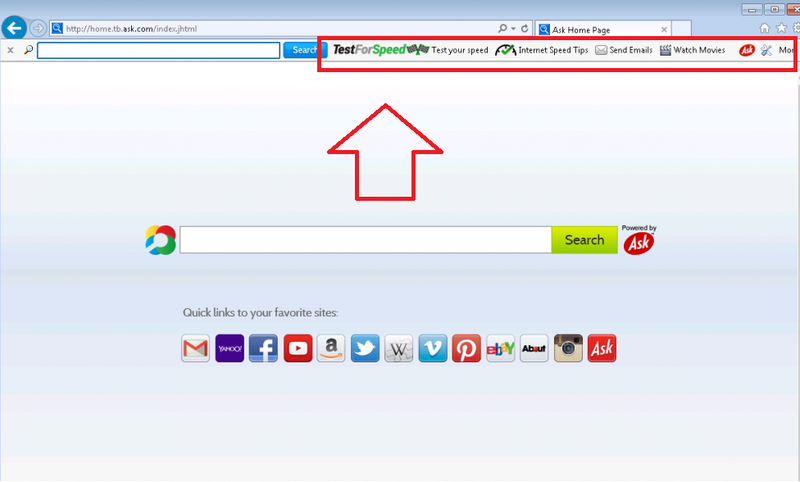 How to remove TestForSpeed Toolbar from my PC? TestForSpeed Toolbar removal can be done best by a reliable anti-malware and anti-spyware application Wipersoft. That is because the manual elimination process is quite complicated. If you uninstall TestForSpeed Toolbar from your Control Panel, you remove it only from Internet Explorer. For other browsers, you have to also access the browser’s add-on manager and change the homepage and search provider manually.